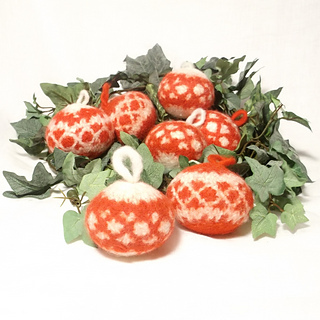 A new collection of easy to knit and felt Christmas Baubles. The nights grow longer and it’s time to get knitting again, so why not cosy up and make your own baubles this year? These traditionally styled baubles are simple and quick to make. They are knitted flat using chunky Filz/Felting wool which shrinks into thick soft felt after a cycle or two in your washing machine. As the decoration is added after the baubles have been made up and before felting, the crosses blend into the felt as though they were knitted in. 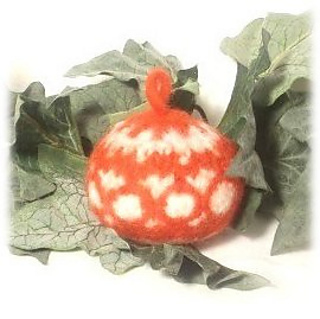 These patterns can also be used to make plain baubles in a single colour which you can embellish as you wish using needle felting, sequins, ribbon or embroidery. Basic skills needed for this design. kfb = Increase 1 stitch by knitting into the front and then the back of the stitch. skpo = (s1, k1,psso) Slip next stitch knit wise onto the right hand needle, knit the next stitch then pass the slipped stitch back over the knitted stitch and off the needle.